When Supergirl was first announced as a show, there was some dream casting on who would play the title role. TV Line’s Matt Webb Mitovich suggested Jane The Virgin’s Yael Grobglas and when I heard that, I agreed and thought she would be great. But that was until I saw Melissa Benoist and then I knew the show got it right. 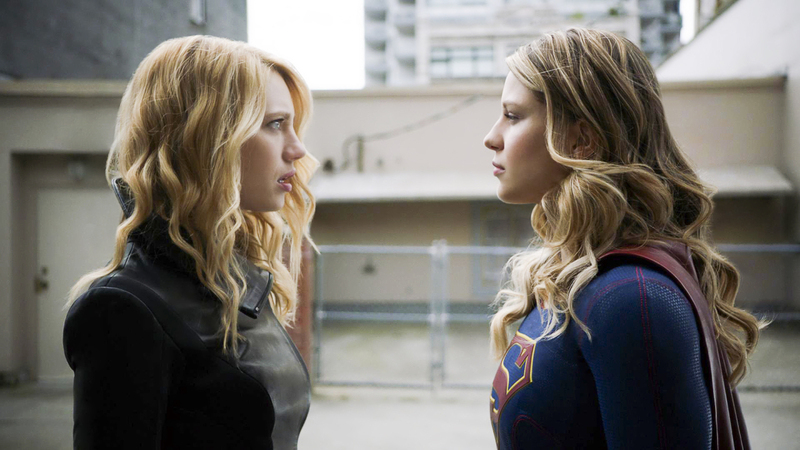 However, Grobglas still got to play in the Supergirl sandbox as the villain of the week, Psi aka Gayle March, a meta human who has the ability to play on people’s fears to get what she wants. And what Psi wants is money and she has been robbing banks left right and centre around National City. When Supergirl encounters Psi, she uses her power to get Kara to relieve the worst day of her life, the day Krypton is destroyed. We then get our second glimpse of Erica Durance as Alura but this time she speaks and this is her saying good bye to Kara and how she will have powers once she is under Earth’s yellow sun. When the see Kara’s POV in her pod as she sees Krypton’s destruction. Despite having his own mind abilities, J’onn is unable to protect Kara from Psi’s powers. At the DEO, Kara enlists Winn’s help in finding a way to dampen Psi’s powers and confides in him how her powers work as a way to track her. Meanwhile, Lena begins her first day as CatCo’s new CEO and immediately clashes with James over how to run things. Also, Lena sees how distracted Kara is when she tries to assign her some tasks. Lena thinks Kara is distracted over Mon-el but when Kara snaps at her, she goes into boss mode and tells Kara how her behaviour on the job is unacceptable and needs to do tasks as assigned. Kara gets an alert that Psi has attacked again but when she goes to stop her, she thinks Psi has hit here again with her powers. But at the DEO, Winn tells her she had a panic attack. Later at Kara’s place, she recites a Kryptonian mantra in hopes to clear her mind. Alex comes over and knows what is wrong with her as Winn spilled the beans. Kara admits she doesn’t know if she can defeat Psi. Less we forget about Sam Arias and her daughter Ruby, we learn that Ruby believes her mom has super powers. Ruby thinks so because that is the only reason why her mom was able to left the piece of the stage off of her. Sam tells Ruby it was adrenalin. Also, Sam has a new job but she has to leave early because Ruby got into a fight with a classmate who didn’t believe that Ruby’s mom has superpowers. So Ruby runs away and ends up at a pizza joint that happens to be in front of Psi’s robbery of a armoured truck where she steals the money by playing on the guards’ fear of bees. Also to create further chaos, she got a construction workers to swing around a wrecking bowl by playing on his fear of snakes. As the chaos is going on, Ruby texts her mom asking her to save her. Sam arrives and sees Ruby wade into danger. Sam runs to a fallen Ruby and the wrecking ball starts to fall on them. Hwoever, Supergirl arrives to catch it and move out of danger. Supergirl then confronts Psi with a device that is supposed to block Psi’s powers but it doesn’t. Psi uses her psychic abilities to blow Supergirl away. With Supergirl on the ground, Alex comes upon her and sees that she blames herself for Mon-el’s death. Kara believes by putting Mon-el in the pod that she sent him to his death as that is the only reason why they haven’t heard from him. Alex tells Kara that Mon-el isn’t dead. This seems to snap Kara out of her funk and confronts Psi. Psi tries to use her powers against Supergirl but it doesn’t work as she head butts her unconscious. The DEO arrives to take Psi away. And can I say how great Grobglas was as Psi? Grobglas looked like she was having a blast playing a straight up villain unlike the complex Petra who is more of a frenemy on Jane the Virgin. Afterwards, we learn that Ruby was obsessed with her mom having superpowers as she believed it would get her to stop working. Ruby thinks she would be rescuing people just like Supergirl and the would have more time to spend with her. Later we see Sam try to bend a crowbar with no luck thus confirming that she does not have superpowers (but we know otherwise). And it will be interesting to see Sam become the big bad Reign because right now she is so darn likeable especially with her relationship with her daughter Ruby. Hopefully, Ruby can be the one to maintain her humanity. Back at CatCo, Kara apologizes to Lena and confesses that her feelings about losing Mon-el is worse then she let on. The two quickly make-up. Lena also introduces Kara to the person that will be taking over for her at L-Corp: Sam Arias. And in Sanvers news, the two seem to be headed for a breakup as they can’t decide on DJ versus a band for their reception and also whether or not they want children. At episode’s end, J’onn is at the alien bar having a beer when he hears M’gann’s voice calling his name. M’gann in her Martian guise then appears in front of him asking him to return to Mars. This obviously sets up Carl Lumbly on the show as J’onn’s father. I wish we had more of Erica this episode. Hopefully, there is actually an important arc with Alura, instead of simply casting Erica just because she is a legacy actor.